So, let's talk about quantum mechanics for a bit. Specifically, let's talk about what is known as the Heisenberg Uncertainty Principle. Jane Goodall didn't study chimpanzees. Yes, lived in Africa, entrenched herself in the surroundings, and famously detailed the comings and goings of a group of chimps. But it was impossible for her to study chimpanzees in a general way. Instead, what she really studied were a group of chimpanzees who were being studied by Jane Goodall. Whose to say that the presence of this foreign homo sapien didn't completely alter the behavior of those primates. It's impossible for it to not have effected them in some way, and therefore her studies were skewed by her very presence. This is a common aspect of science. The act of experimenting alters that which is being studied. I can not stress the following point enough. This is NOT the Heisenberg Uncertainty principle. This is what many people casually call the uncertainty principle, but the real version of the uncertainty principle is much more interesting. Yes, Goodall's presence had a back reaction on the chimps. But, given enough technology and enough ingenuity, she could have reduced the effect of her presence greatly. One could imagine an extremely well financed biologist who used extremely small flying cameras to study the chimps. These could be no smaller than a fly but could be equipped to take pictures, record sounds, and even intake smells. And they could be made sufficiently small as to not even be noticed by the chimps. Yes, they could in theory have a small effect on the chimps (one could accidentally eat one of these fly-cameras, which would change the behavior of the animal by making it temporarily sick or something). But with sufficient resources, one could make the cameras smaller, or change their algorithms so that they would avoid the chimpanzees better, or that they would taste like real flies, or whatever. The point is that in this example, one can reduce the influence of studying the chimps to an arbitrarily small amount. And if one is unsatisfied, one can always make it smaller. The uncertainty principle doesn't say that measuring something effects the thing that you are measuring. This is obvious. The uncertainly principle says that, when we're talking about measuring really small things (molecules, atoms, electrons, light, etc), we can't just keep making our experiment better and better to minimize its influence on the thing we are studying. 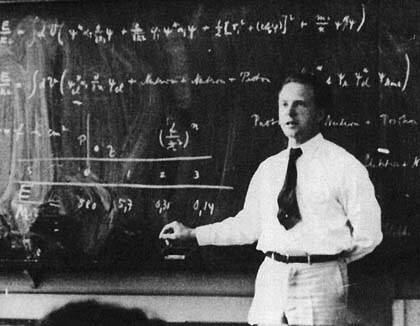 Heisenberg discovered that there was an inherent limit on the extent to which we can measure something without changing it very much. When we reach a certain point, no matter how rich or clever we are, any experiment that makes a better measurement will effect the thing we are measuring more. To take a specific example, consider a thought experiment known as "Heisenberg's Microscope." Imagine that we have an electron (a small charged particle) that is moving in a straight line, and we want to measure it's position by shining a light on it. Imagine we fire the electron in a way so that we know it is traveling in a straight line with a certain speed (old TV's did this using Cathode Ray Tubes). We then have a beam of light that we shine on about where we think the electron will be, and we'll be able to tell it's position based on how the light reflects. It turns out that in order to get better resolution of the position of the electron, we have to use more energetic light (ie light with a smaller wavelength). But if we use more energetic light, the light will "kick" the electron harder when it bounces off of it and wall cause more of a change in the electron's speed. where h is called Plank's constant. This means that if we want to minimize the uncertainty in position, the uncertainty in momentum must go up (momentum is just speed times the mass of the object, so it is more or less the uncertainty in an object's speed). This is how I like to visualize this effect. Say we have a small particle trapped in a box. If it's a really big box, we don't really know where the particle is inside the box, we only know that it's somewhere inside there. Our uncertainty in its position is equal to the size of the box. Now, imagine that we keep making the box smaller and smaller. We still don't know exactly where the particle is inside the box, but as the box gets smaller, the range of places that it can be gets smaller and smaller. So, our uncertainty gets less and less. Heisenberg tells us that in this situation, the particle MUST start to move, and as the box gets smaller, it starts to move faster and faster. Why is this so? Well, we KNEW that the particle always was stationary, we would know its speed exactly, meaning that our uncertainty of its speed would be zero (or very small). And we could then make the box smaller and smaller and our uncertainty on its position would become arbitrarily small. But Heisenberg says that this is impossible; something's got to give. As we make the box smaller, we can no longer be sure that the particle is just sitting there stationary. Our uncertainty in its velocity must increase, meaning it's bouncing back and forth inside the box. As we make the box really, really small, it starts bouncing faster and faster. You should now appreciate that this is a much more profound statement than the simple fact that Chimps were aware of Jane Goodall.